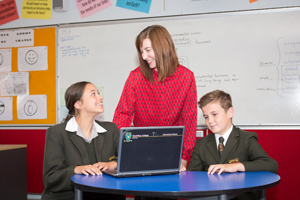 Our Individualised Learning Needs Department complements the pastoral care and curriculum offered at MacKillop College. All students at some point along the learning continuum will have Individualised Learning needs. As a result, the curriculum may need to be further enriched or modified in order to meet individual needs. 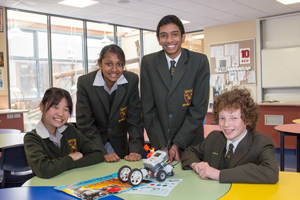 At MacKillop College, our Individualised Learning Needs Department supports integration students by ensuring that they have access to college facilities and they are given the opportunity to participate in a wide range of activities and to experience success. Additional support is provided for students who experience learning difficulties in English and Mathematics. ESL students (those who have a language background other than English) are offered additional assistance in further developing their English language skills. In cases where students experience a prolonged and significant hardship and as a result experience difficulty in completing their work, consideration is given by either reducing or modifying the work. At MacKillop College we strive to meet the intellectual and social-emotional needs of gifted, talented and high ability students. The Julian Tenison Woods Program (JTWP) is a school-wide talent development program, which aims to identify students with high abilities in all areas of school life, and to nurture those abilities by providing opportunities to help them reach their potential. Our programs incorporate contemporary principles of education for high ability learners by providing opportunities for extension, acceleration and enrichment. The Telescope Class is one facet of the Program that exemplifies how curriculum differentiation and interdisciplinary projects can enhance learning for these students. Extracurricular activities such as excursions, competitions and specialised groups or clubs are another way in which students can find like-minded peers and participate in experiences which showcase and continue to develop their specialised talents. The staff members who teach within the Julian Tenison Woods Program are supported with professional development to enable them to differentiate the curriculum on both a group and individual level.